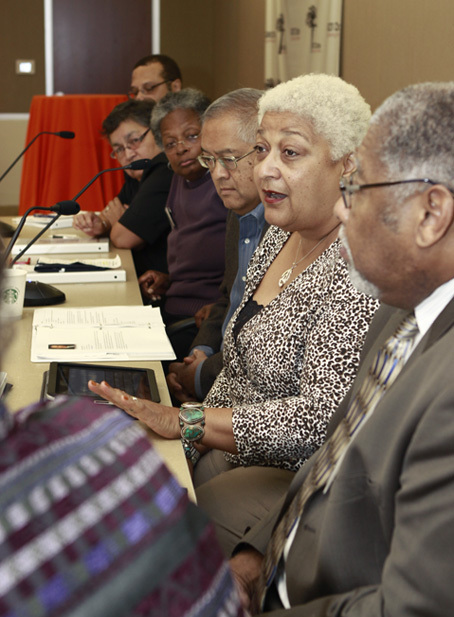 Today was the first day of sessions for the National Convening of POC LGBT Aging Professionals, as someone said, “is a very historic day, an idea that was a dream, today was realized.” From around 8am guests and panelists began arriving at Brickfield Convention Center, AARP’s hi-tech conference facility in the heart of the nation’s capital. Carmelita Tursi, Senior Diversity Advisor HR Group at AARP, provided the opening greetings, while Clarence Fluker, Program Manager, Office of GLBT Affairs, District of Columbia Mayor’s Office, delivered a warm welcome to Washington, D.C. 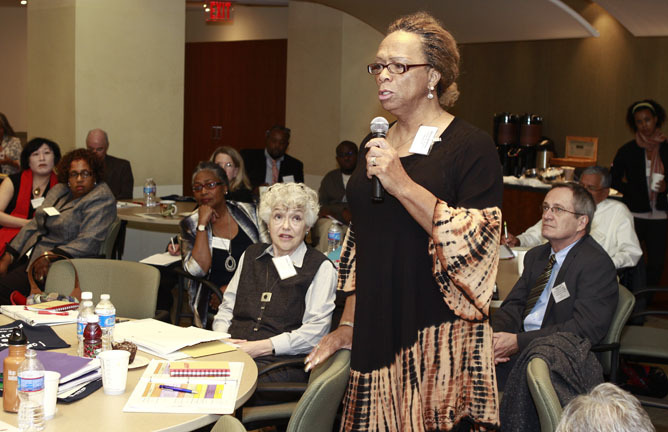 In the absence of Cathy Greenley, Assistant Secretary of Health and Human Services at AOA, Edwin L. Walker, Deputy Assistant Secretary for Policy and Programs Dept. 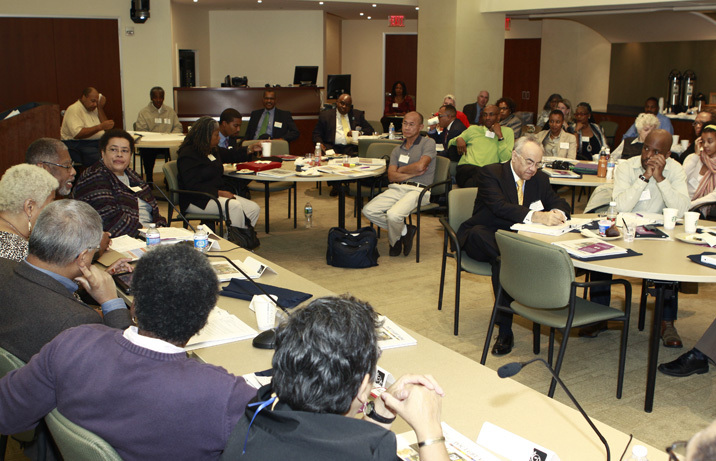 of Health and Human Services, AOA delivered a message form the Assistant Secretary. 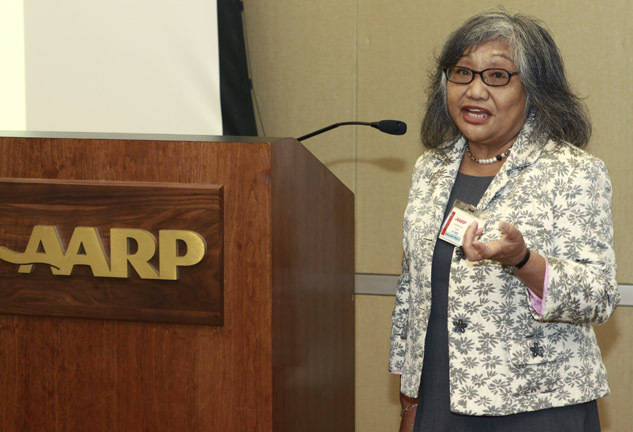 Carmelita Tursi, Senior Diversity Officer, AARP. 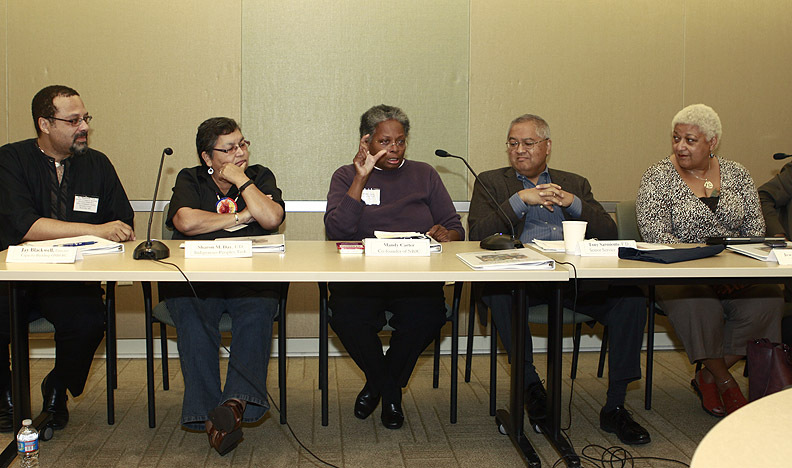 The opening panel, facilitated by Chezia Carraway, LCSW, PHE Center for Disease Control and Prevention, was comprised of Jay Blackwell, Director, Capacity Building Division OMH-RC, Sharon M. Day, E.D., Indigenous People Task Force, Mandy Carter, Co-Founder, NBJC and Nobel Peace Prize Nominee, Tony Sarmiento, E.D., Senior Services America, Inc., Jewelle Gomez, Grants and Community Initiatives, Horizons Foundation and Christopher Bates, CEO, PACHA. Sharon M. Day, Mandy Carter and Tony Sarmiento. 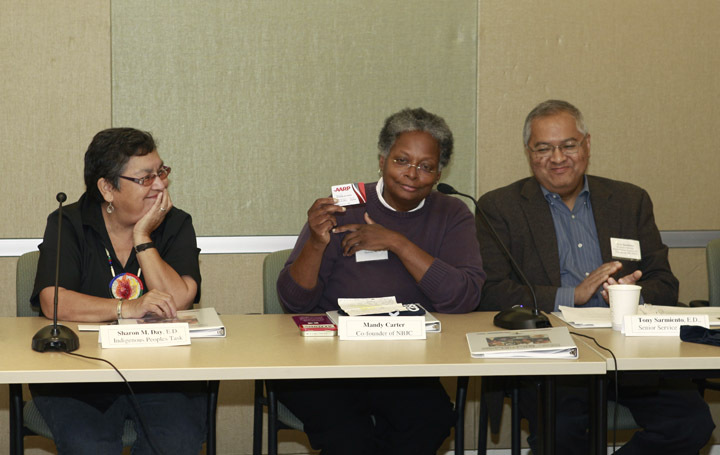 Jewelle Gomez (2nd from right). This lively panel drew from the history of struggles to address core issues and philosophy including strategy for the creation of a network that truly defines and represents the POC LGBT aging community. 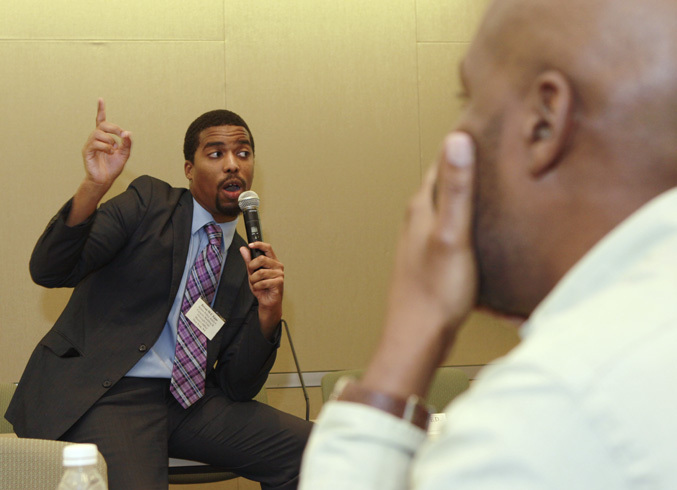 While Bryan Epps, Senior Policy Analyst, NYC Mayor’s Office laid out the fundamentals of policy creation and the benefits in support of issue advocacy. 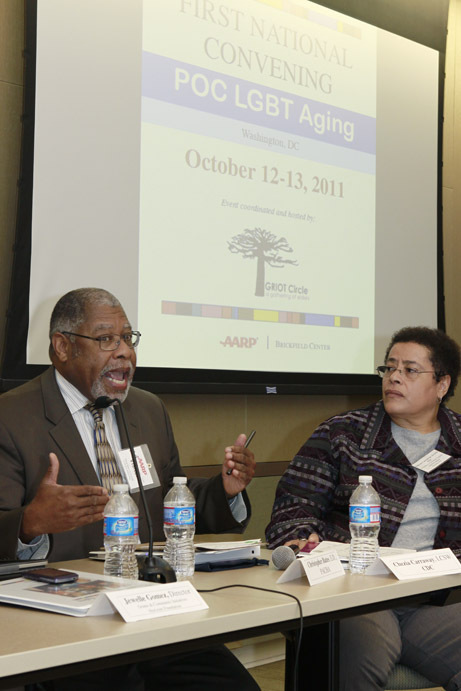 Chair Elect, ASA, Louis Colbert was the Keynote Speaker who spoke on the importance of this convening on the national landscape of aging. Panelist Christopher Bates and facilitator Chezia Carraway, LCSW, PHE. 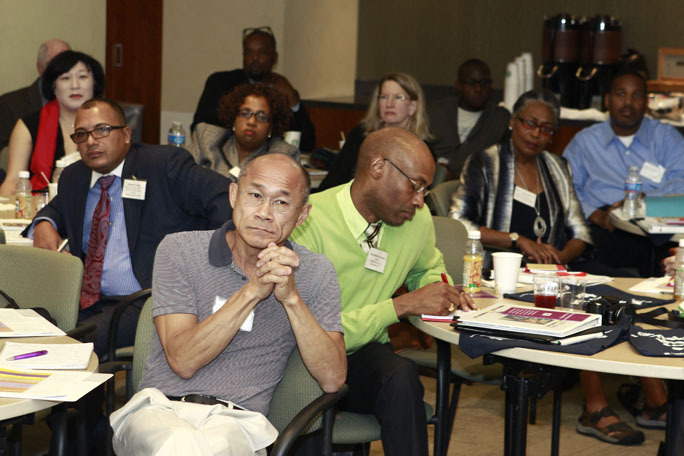 The workshop component was structured into six discussion groups that allowed for an intimate and comprehensive discourse. Each group tackled a subject area: Elder abuse, Mental Health, Immigration, Housing, Health Care and Spirituality. 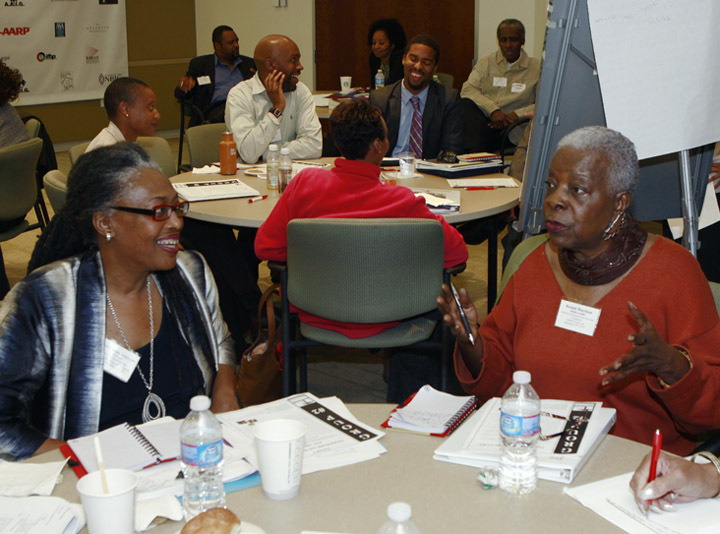 Facilitator Victor Pond, Director of Policy, Research and Community Health, GRIOT Circle, coordinated the questions and group feedback. The first day of the Convening closed with a dialogue facilitated by Carmen Vazquez, coordinator NYS LGBT Health and Human Services Unit of the AIDS Institute, on the challenges and opportunities for the creation of a professional network. Helena Bushong, Trans-elder Community Advocate/Activist. Jay Blackwell, Sharon M. Day, Mandy Carter, Tony Sarmiento and Jewelle Gomez. 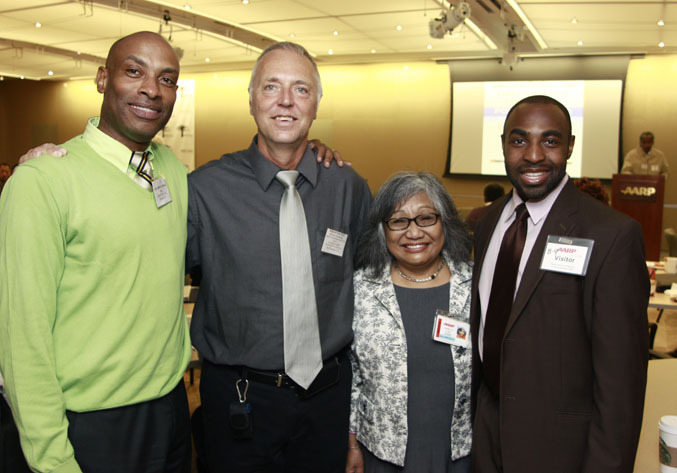 Glen Francis, E.D., GRIOT Circle, Brian de Vries, PhD, San Francisco State Univ., Carmelita Tursi, Senior Diversity Advisor, AARP and Clarence Fluker, Office of GLBT Affairs, D.C. Mayor's Office. Workshops: Cheryl D. Reese and Bonnie Harrison. 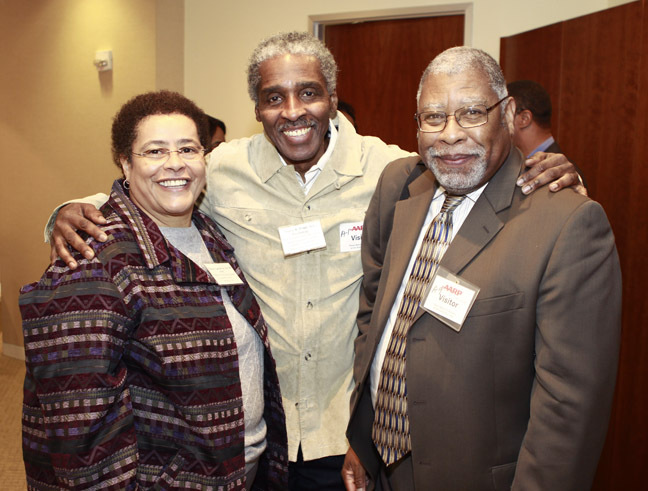 Convening Coordinator Victor Pond is flanked by Chezia Carraway and Christopher Bates at end of first panel discussion. GRIOT Circle is an intergenerational and culturally diverse community-based social service organization responsive to the realities of older lesbians, gay men, bisexuals, two-spirit and transgender people (LGBTST) of all colors. The Brooklyn-based non-profit was founded in 1996 by Regina Shavers to promote healthy living and sustainability, and support the unique social services needs of the LGBTST elders community in New York. Posted on October 13, 2011, in Discrimination, Elder Advocacy, Equality, My Bisexual Lifestyle, My Gay Lifestyle, My Lesbian Lifestyle, My Transgender Lifestyle, My Two-Spirit Lifestyle, Our Rich Legacy, Pride & Politics, Self-improvement, Taking the Lead, Uncategorized, Workplace and tagged AARP, Cathy Greenley, Elder Advocacy, Jewelle Gomez, LGBT People of Color, Senior Services, United States Department of Health and Human Services. Bookmark the permalink. Leave a comment.